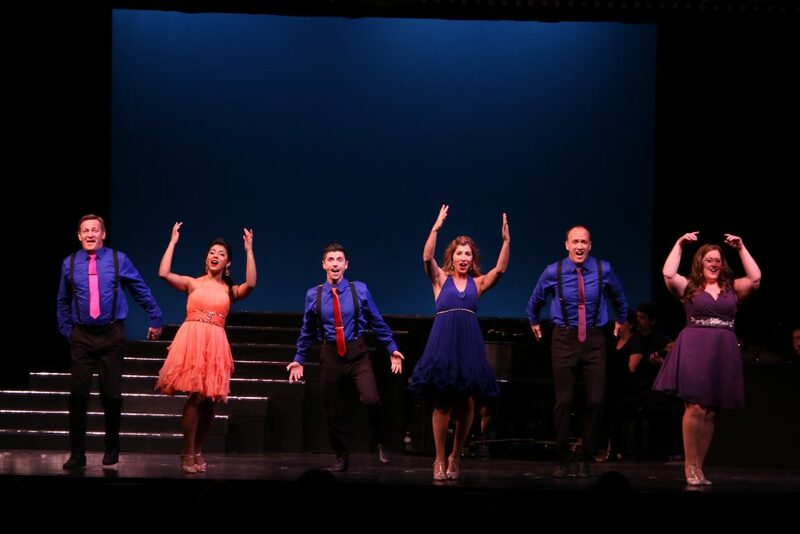 Showtune, a marvelous collection of melodies crafted by Broadway composer and lyricist Jerry Herman, is entertaining near-full houses at the Delray Beach Playhouse. A half-dozen vocalists — some DBP veterans, others newer to the stage at the east end of Lake Ida Park — are assigned the task of bringing Herman’s works to life. The quick-moving program is made up of 40-plus tunes from Herman’s hit shows — Hello, Dolly, Mame and La Cage aux Folles — as well as less successful productions that include Dear World, The Grand Tour, Mack and Mabel, Milk and Honey and A Day in Hollywood, A Night in the Ukraine. Performance duties fall to Jim and Diane Tyminski, a husband-and-wife pair of DBP regulars who’ve often sung together; Spensyr Bach, who added her stellar vocals to at least four recent Delray musicals; Hanz Enyeart, a visiting stage personality from San Diego who not only sings and dances, but choreographs and directs the show; Michael DeGrotta, a Delray stage staple for 38 years, most recently in California Suite and Alisha Kothari, a multi-talented performer with vocal pizzazz and dance acuity. As everyone knows, having a live band perks up any musical, and Showtune is backed by marvelous musicians — musical director Toni Stamos, Brandon Stair on bass, David Koll on percussion and Jim Poch manning the keyboards. Stage manager Marilyn Mishkin does her usual excellent job, as she has for each show this season. The cast encounters some Act I jitters and hits some slightly off-key potholes, but miscues become fewer and farther between when the players gain momentum and confidence. The finale is a wonderful mix of Herman’s best, worthy of much more than the subdued standing ovation it received on opening night. Conceived by Paul Gilger, this revue has no dialogue, but its songs are grouped into thematic scenes that tell stories and place a strong emphasis on Herman’s lyrics and their messages. Showtune begins on an optimistic note with “It’s Today,” the opening number from Mame, and “Big Time” from Mack and Mabel. The show moves on to “We Need A Little Christmas” (Mame) and “Put on Your Sunday Clothes,” (Hello, Dolly) which touch on Herman’s strategies for dealing with bad news and hard times. DeGrotta comes forward with a sensitive rendition of “A Little More Mascara” (La Cage aux Folles), emotionally telling of his life as he transforms from male persona to feminine celebrity, Zaza. 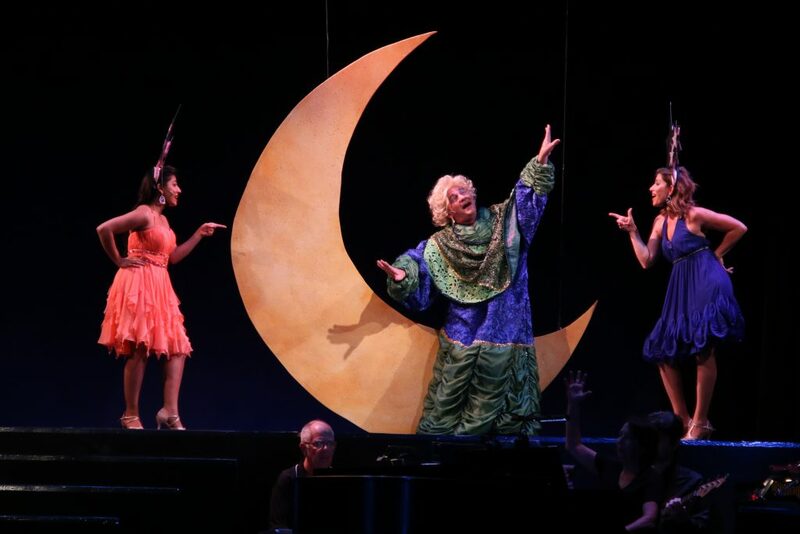 A crescent moon descends, and Zaza performs “The Man in the Moon,” a vocal from Mame. The cast gathers to sing “I Am What I Am,” the anthem from La Cage that affirms pride and self-assurance. Act II pays tribute to Mack and Mabel, the play recalling the tumultuous love affair between silent film producer Mack Sennett and his top star, Mabel Normand. The set of songs includes “Movies Were Movies” and “Look What Happened to Mabel,” along with “That’s How Young I Feel” from Mame. With all six performers looking at a movie screen, the cast sings, “Just Go to the Movies” from A Day in Hollywood, A Night in the Ukraine. Images of famous stars from the past flash by, creating a nostalgic audience moment. Showtune plays through April 7 at the Delray Beach Playhouse, 950 NW 9th St. (Lake Shore Drive), Delray Beach. All tickets are $30 and may be purchased online at delraybeachplayhouse.com or by calling 561-272-1281.